Glenn Alvin Alexander, 60, of Terre Haute and formerly of Taswell, IN, died Sunday, November 11, 2018. Glenn previously worked at OFS in Huntingburg, IN. He was born January 31, 1958 in Hillsboro, OH to James and Norma Rhoads Alexander. 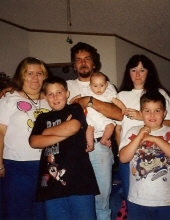 Survivors include his four children; Cody, Michael, and Misty Dawn Alexander of Texas, and Samantha Alexander of Jasper, IN; seven siblings, David Alexander, Bill Rhoads, Tonya Alexander, Debbie Inlow, Judy Inlow, Kathleen Alexander, and Jimmy Alexander. Glenn was preceded in death by his parents and two siblings; Linda Knisley and Steve Alexander. Arrangements are under direction of Callahan & Hughes Funeral Home. To send flowers or a remembrance gift to the family of Glenn Alexander, please visit our Tribute Store. "Email Address" would like to share the life celebration of Glenn Alexander. Click on the "link" to go to share a favorite memory or leave a condolence message for the family.